Those of you who know my background will (I hope) be unsurprised to find me using blatant sales promotion techniques to bring my latest offering to the attention of the massed ranks of my business contacts. And anyone else who falls across this message. Having spent half a lifetime devising and implementing promotions for many major national (and international) brands, it dawned on me – as with cobbler’s children syndrome* – that I wasn’t utilising those very tools to bring my own wares to the attention of a wider audience, in order to bring increasing numbers into the fold. Everyone knows that the word ‘FREE’ is the biggest incentive in the English language. And I can already hear the cynics among you mouthing the mantra, “There’s no such thing as a free lunch.” That may be true, but I’m not offering lunch, or indeed any other comestible. I am, however, offering some FREE INFORMATION. Now we are in a knowledge economy, the best way to persuade people to part with money is to give away some of the crown jewels of your own expertise, whatever it is – but not enough to allow the recipients to do it all without you. There is a second reason too: in my researches, to try to improve my knowledge of the use of social media for business purposes, I discovered that having a landing page on the website which offers something for nothing – such as a FREE E-BOOK – is an essential tool in the armoury of the modern marketeer. I already know this, in truth, but finally I am putting into practice my own advice. And I’d like YOUR HELP to make it succeed. 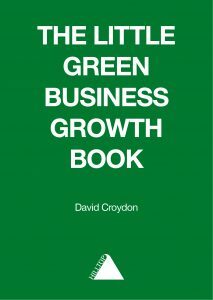 I wrote “The Little Green Business Growth Book” for a number of reasons – not just to have something free to give away on my landing page. Though that is its primary objective. Whenever I am asked what I do (if you do enough networking, you’ll know the score), I usually find myself picking one of four related areas of activity and extemporising on that, to the exclusion of the other three. Why? Well, watching other people pouring petrol over themselves and lighting matches is rarely a welcome sight. The elevator pitch code of conduct says you’ve got between 30 seconds and a minute to get across the essence of your gainful employment, before their attention starts to drift. But what if you do several different (albeit related) things? Either you try to cover the ground with a few well-chosen but massive generalisations. Or you pick one area and go into it in a bit more detail. Either way, you miss a lot of potential. 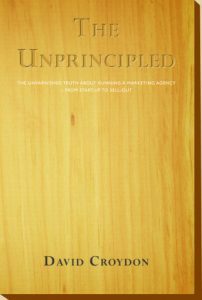 So I decided to create a pocket book (A6 in printed form) that condensed much of my knowledge and methodologies for helping businesses grow into a 50-page book. A 20-30-minute read, tops. But I should like to beg a small favour from you in return. In order to increase the reach of this message, especially to owner/managers of growing SMEs, which are the core targets of the book, would you FORWARD this message TO THREE potentially interested BUSINESS OWNERS. This already goes (just through all those signed up) to nearly a thousand recipients, but I could double or treble its reach, and therefore awareness of me and my wares, if you will do me this small favour. And naturally, I should appreciate feedback on what you think of the book’s content too. But all in good time. First you have to apply for it. And read it. I realise that this is a more overtly self-promotional missive than my normal offering (I will revert to type next issue), but maybe you too should be thinking about what you could produce and give away, that would offer genuine value, while clarifying your own business’s ‘uncommon offering’ (see page 29 of the pocket book), and attracting business prospects along the way. * And for those of you who have got this far and don’t know what cobbler’s children syndrome is, it was an old wives’ saying that the cobbler’s children were always the worst shod in the village because he was too busy making and mending his customers’ shoes to look after his own.